There are many applications in which functionality of the parts require for a complicated head geometry and large head-to-shank ratio parts. 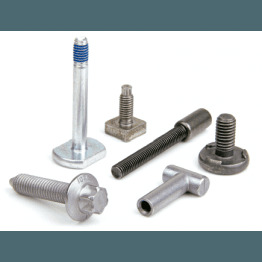 We could mention large cylindrical drilled head for sealing screws, shoulder screws or large flange head to increase friction and stripping resistance. Our CNC machine section enables us to make second operation when it's requested to make drill holes, clearance grooves or undercuts. We produce this type of special parts under special demand to fit your exact requirements.